We’re back, with another Big Finish Doctor Who audio drama review! A few weeks ago, we reached the end of the four early anthologies in the Short Trips range. Today, we pick up that range with the first of its individual releases, Flywheel Revolution! This story was released in January 2015, nearly four years after the previous release in the range, and it is a different animal—longer, with a more involved plot, and a somewhat slower pace. It will set the template for future releases in the range, continuing to the present day. Written by Dale Smith, and directed by Lisa Bowerman, the story features the First Doctor, and is read by Peter Purves. Let’s get started! On a distant and far-future world, a robot named Frankie is confined to a scrapheap. He and his friends—all flawed or damaged—have been consigned here by their masters and makers, who are robots themselves, sent to colonize and develop this world. Frankie is a rover, and his flaw is that his geolocation module doesn’t work; he cannot receive the global timestamp signal, and so for him, it is always 5:15 and 23 seconds. Therefore, he gets lost very easily. This comes into play when he takes his friend—a misaligned boring machine named Toby—to see a monster in the scrapheap. Though he navigates by bouncing off of the magnetic Wall that defines the edges of the scrapheap, he is unable to lead Toby to the monster. Over several days, he does not give up; and eventually he finds the monster, living—to Frankie’s horror—in the gutted interior of another, larger robot! The creature calls out to him, and seems delighted to see him, but he backs off in fear. Still, his curiosity is fully engaged; and after a few more days of wandering, he finds the monster again. This time, it calls itself the Doctor. Over a few contacts—horrified on Frankie’s part, excited on the Doctor’s—Frankie learns that the Doctor is also trapped here, separated from his companions and his ship. Communications break down when Frankie sees that the Doctor has built a device to shut off the wall—shut it off? Let them all escape? Frankie can hardly dare to dream of it!—but he has built it from the scavenged parts of Frankie’s dead friends! Frankie erupts at him, and leaves in fury. When he next sees the Doctor, the creature is solemnly apologetic. He had not understood the horror of what he had done; all he had seen were components. But now, he has disassembled his device…and he asks Frankie to help him lay them to rest with respect. This, at last, wins Frankie’s trust; and when the Doctor offers to repair his geolocation device, he is intrigued (though he does not accept). Soon, however, the Doctor makes a breakthrough with the Wall. He sends Frankie to gather all of his friends; and he tells them they will soon be free. Then, he has Toby dig down into the soft soil beneath the scrapheap and fill another machine with the dirt—and he launches it skyward, raining down on the wall. Soon, this barrage overloads the magnetic wall, and it fails. The machines are free. Before the Doctor leaves, he thanks Frankie for his help; and he asks the robot what he will do with his newfound freedom. Frankie thinks that he would like to find the people who condemned them all to the Scrapheap…and teach them how wrong they were. He trundles off, noting that it is five-fifteen and twenty-three seconds—the moment when his new life begins. As with most short trips, this story happens in a bubble of sorts. The story takes place on a planet whose identity is not given, not populated with any race we’ve previously seen, at a time that is not identified (only that it is in the far future), separate from his TARDIS, and separate from his companions (Ian, Barbara, and Susan, though they are not named, only loosely described). As such, there’s very little continuity to speak of, which is something we saw often in the early anthologies, and I expect it to be the standard henceforward as well. The most accurate word I can apply to this story is “charming”. It’s the story of the Doctor facilitating a revolution—but not a bloody one; rather, a very small one, not much more than a family squabble of sorts. The robots with whom he deals are most definitely people in their own right; but they’re much like children, and he is very paternal toward them. Paternalism is a common enough trait with the First Doctor, and often it works out badly, but here it seems to be a good thing. On television, the First Doctor was clever, but not nearly as resourceful as his later incarnations, especially in technological matters. Out of universe, that’s an artifact of the show’s early shifts in direction, I think, as it tried to find a stable identity after starting out as a children’s programme. As well, of course, the Doctor wasn’t really the main character at first, and so most of the resourcefulness was exhibited by the companions. Put another way, the Doctor got them into trouble; the companions got them out. Here, though, he’s quite resourceful (and has to be, given that he’s on his own). He correctly analyzes the political situation (if you can call it that) on the planet; he figures out the wall; he recognizes and understands the various robots; and he expresses his ability to repair them, though they don’t take him up on it. He builds a device from spare parts, though—for reasons revealed in the story—he doesn’t use it. He also has a keen, if belated, understanding of the personalities of the other characters. It’s really a good showing for the First Doctor, at a point in his life when frankly, he could use some good press. Though the story is set during Ian, Barbara, and Susan’s era, the story is read by Peter Purves (Steven’s actor). I haven’t checked far enough ahead to be sure, but I believe this is usual procedure for First Doctor short trips, at least for awhile (I vaguely seem to recall that William Russell may have read a few? We’ll find out soon enough). Purves is, I think, one of the most steady and reliable narrators in Big Finish’s stable. His performances aren’t revolutionary in any way, but they’re steadily good; and he captures the First Doctor fairly well. Overall, it’s not a bad foot to put forward with regard to reopening this range. It’s a fairly safe story—nothing too experimental, and we know from the Main Range that “experimental” is a mixed bag at best for Big Finish. At the same time, it manages to feel significant in a way that most of the anthology stories did not. If the upcoming entries can build on this start, the range will be in good hands (and the fact that it’s still running, three and a half years later, says that that is probably the case). Next time: We’ll join Frazer Hines reading for the Second Doctor, Jamie, and Zoe in Little Doctors! See you there. We’re back, with another Big Finish Doctor Who audio drama review! Today we’re concluding our examination of the early Short Trips anthologies with the Eighth Doctor’s contribution to the Short Trips, Volume IV collection: Quantum Heresy! Written by Avril Naude, and read by India Fisher, this story features the Eighth Doctor traveling companionless. Let’s get started! A woman with an…oddly loose grasp of time…works in an archive on Earth. All seems well at first; but then she realizes that she is living the same moments over and over again. Later, the strange man called the Doctor will tell her that she is time-sensitive, or else she would never have noticed. While checking data in the archive, the woman sees the Doctor appear out of apparently nowhere. He seems familiar, and introduces himself as “the Doctor”; then says an odd thing: “Oh, but you won’t have met me yet.” The woman feels increasingly panicked, but she swears she knows him, somehow. He escorts her deeper into the archive, and shows her an old man, shuffling forward, muttering something. Strangely, the Doctor calls the man “it”. The Doctor refuses to let her speak or approach, despite the overwhelming urge to hear what the man says. Again she is working in the archive, alone in the quiet and dust. She thinks she has always been here. The man called the Doctor approaches, and she remembers him; but when he is gone, she forgets. Perhaps this happens over and over; she doesn’t know. It happens again, and she thinks that she stays because it is her duty. She hears the old man shuffling closer and muttering. She wants to know what he says; but she is afraid. She sees the old man searching for something—and then the Doctor appears, but she does not recognize him this time. He warns her back, and the old man shuffles away. He tells her that time is repeating itself, and even he is caught in it. He says he keeps arriving in this time loop at different points, until he gets it right—and then he vanishes. The woman works in the archive, checking data, in the dust and the quiet. She thinks of the Doctor as she eats her lunch, and he appears, looking tired and worn. He asks for something to eat, and she offers him her lunch. He laments that he can’t seem to break the time loop—and then he realizes she remembered him this time. She says that he told her it was vital that she remember. He doesn’t seem to know that, but is cheered by the news. Still, she thinks she has forgotten something. He asks if she remembers the old man—and the loop resets. She works again. She knows now that the loop exists, and the Doctor is real—but not here. Her time sense awakens, and she realizes the days are not identical. She thinks of the old man, and the Doctor’s warning to avoid him. But would hearing him help or hurt? She is not even sure who she is. She is no longer checking data storage, and the archive sits in its dust. Is any of this real? The old man passes by, and seems worse than before. Her compulsion to hear him is much stronger. The Doctor appears and breaks the spell again. She wonders not who she is, but what. Another loop. She longs to be free, and is angry over it. It feels as though time has stopped. She calls out for the Doctor, and she hears his voice, now dry and cracked. He tells her it’s time—he has worked it out, and she has remembered. The time loop is an experiment. The old man is no man at all; he’s a creature from another dimension, trying to push through. And the woman…she WAS the experiment. She was created from raw matter, but has become a living person. The old man wanted to control her so as to manipulate the Doctor’s reality. But she resisted—and the experiment failed. She sees the old man, and he looks like a hole in reality. It burns and dies in front of them. The Doctor says that had she approached it, it would have granted the creature control—and she would have died. The archive is not real, and it begins to crumble around her. She tries to hold on—but the Doctor assures her she is part of real reality now, and she can break free. So, she does. Now, she has her own life, and freedom—and things can change and be different. She knows what the Doctor meant when he said she would understand in time—she would understand when she began to live in real time. More, she understands the Doctor—and just how much the universe owes him. It has always seemed to me that the Eighth Doctor era—having lacked a television series to set its tone—has become the dumping ground for the most weird and bizarre and—to borrow the Tenth Doctor’s term—timey-wimey stories in the DW canon. One need only to look at Zagreus (which I haven’t covered yet, but have heard enough about) to know that that is the case. His stories push the limits of time travel and dimensions and universes and his own lifespan and nearly any other fantastic aspect of the series. This story, while hardly the most large-scale or dramatic, fits right in. It concerns a time loop—standard fare by itself—that is more than it seems, and gradually reveals an otherworldly creature (villain? By default, I suppose, but we don’t get very far into that aspect) trying to break into reality, as well as an artificial lifeform that becomes real. Pinocchio ain’t got nothin’ on this story, friends. Being a story of a time loop—but with the Doctor dropping in at non-sequential points—the story is told in non-linear fashion. Sometimes, as with Creatures of Beauty (which I recently covered), that can become a problem, as the story gives itself away too early. Here, I think it’s saved by the fact that it’s essentially a bottle episode; there are very few characters, in a very contained environment, and we’re only seeing the story from one character’s perspective, which is subject to the rules of the time loop. Thus, we don’t get the ending spoiled before we get there, despite the non-linear structure. That’s a rare combination of factors indeed, but it works here. The Eighth Doctor is traveling alone, but that does little to establish when in his timeline the story takes place. If we got a good description of his hair or clothes, it might narrow it down; but the point-of-view character has other, more pressing concerns, and doesn’t oblige us. As is typical in these anthologies, there are no continuity references (we don’t even see a sonic screwdriver! ), and that further obscures any attempt to place the story. Being a bottle episode, that’s just as well, I suppose; it doesn’t NEED to have any bearing on any other stories. As with past Eighth Doctor short trips, India Fisher (of Charley Pollard fame) does the reading; she’s passable and formal, but she doesn’t really attempt to capture the Doctor’s voice or mannerisms. I think that’s acceptable in audiobook format; it’s nice when we can get the different voices, but it’s not necessary. Overall: A nice story, self-contained in more than one sense, and a decent wrap-up to both the fourth volume and the anthologies as a group. I haven’t always been optimistic about the Eighth Doctor’s short trips thus far, but this one is decent. It’s also short; I didn’t do the math, but I suspect it’s the shortest installment in this anthology. If you’ve made it this far, give this one a listen as well. And that’s that! When we return, we’ll begin listening to the individual Short Trips, which tend to be longer and more involved—someone recently compared them to the Companion Chronicles, but in short form, and I think that’s an apt comparison. I should note that there’s a significant gap in release dates between Volume IV, published in 2011, and the first single release, published in January 2015. We’ll begin with the First Doctor in Dale Smith’s Flywheel Revolution! See you there. We’re back, with another Big Finish Doctor Who audio drama review! Today we’re listening to The Shadow Trader, the Seventh Doctor’s entry into the Short Trips, Volume IV anthology. This story was written by Charles Williams, and features the Sixth Doctor and Ace, and is read by Sophie Aldred. Let’s get started! Salim is a shadow trader. It’s an old profession, one practiced by his father before him, and dating all the way back to the old days on Earth. Some cultures have known for centuries that buildings—and in these days, spaceships—have souls of their own; it’s why a man may call his ship “she”, and put faith in its abilities. Those souls don’t happen; they are acquired by binding a shadow to the bones of the building or the ship. That’s where the shadow traders, like Salim, come in. It’s a little bit magical, but it always works—as Salim’s dying father taught him. Salim wasn’t the greatest at the job, but that didn’t matter; all his father asked of him was that he live, procreate, and pass on the skills to his son, who might do it better. Fraser’s Rest, in orbit around the old colony of Sonos Prime, is a declining shipyard and trading post—once more powerful, but now diminished in the face of new settlements. Salim fits in here; he doesn’t stand out in this decaying realm of reduced activity. He finds a ship in the midst of construction, and watches the activity; it’s a luxury cruiser for a billionaire, quite a prominent addition to the construction yards of Fraser’s Rest, but that is because the billionaire grew up here, and feels some affection for the place. It is, perhaps, the last chance for the Rest. Salim has been staking it out for days, trying to determine what kind of soul—what kind of shadow—this ship should have. Even its name has not been decided; but the shipbuilders have been calling it the Defiance. Now Salim must search for a person to provide the shadow—someone who matches the character of the Defiance. He finds it in a girl with a bulky jacket, a rucksack, and a ponytail. He follows the girl, Ace, as she rejoins a little man called the Doctor—or the Professor, as she calls him. They are here to watch a launch, but the Doctor ruefully notes that he may have brought them to the wrong year, as he remembers the places being more upscale. He admits there is nothing special about this ship launch, but that he just likes to watch them, and think about what adventures it may have. Ace isn’t interested, and heads back to their own ship, the TARDIS. Salim thinks on how to cut the girl’s shadow away. Salim follows Ace down a lonely corridor, and sets a music box playing. Ace hears the music, which grows more and more complex; she finds it has caused her to be stuck in place. Salim confronts her, and she finds she cannot even approach him. He tells her that her shadow is holding him in place; it can’t move, and therefore neither can she. He produces a strange, circuitry-laden knife, and turns it on. He tells her to hold still, so that he can cut off her shadow; Ace threatens to kick him if he approaches. Salim is okay with this; they’ll be in a stalemate until she lets him take the shadow. They are interrupted by the approach of the Doctor. Ace warns him away; the Doctor is unperturbed, and recognizes music box as a shadow lure. He states that it won’t work on him, to Salim’s surprise. The Doctor says this is because he has no shadow; and he knocks the music box from Salim’s hand, breaking it. Ace immediately kicks him to the floor. The Doctor examines the knife, which is quite blunt, and says that it cuts shadows, not flesh. He recognizes Salim as a shadow trader, something he last encountered in nineteenth-century London. Salim defends his profession as noble; the Doctor counters that there is nothing noble about waving a knife at a girl in an alley, and says that Salim’s ancestors wouldn’t do it this way. They would offer a deal instead, though often not a favorable one. The Doctor explains that taking the shadow takes the person’s substance, causing their lives to go nowhere; past victims would end up in freak shows, or in bedlam. Salim objects that people must have sold the shadows willingly; the Doctor acknowledges that sometimes the downtrodden would do so, for the lure of being part of something great. Some people have felt that all they have to offer in life…is their shadow. The Doctor leaves, taking Ace with him; without the lure, Salim may still be a parasite, but he’ll have to be a traditional one. Salim watches the Defiance under construction, and thinks about his father, and about the many others who have desired to be part of something bigger. For a moment, he feels that desire as well…and then it is gone. I commented back in Volume II that the Seventh Doctor’s stories in these early anthologies seem to be built around the idea of teaching someone a life lesson. Saving the world—when it happens—is secondary to that purpose. The same holds true here, but with a twist that left the story a bit unsatisfying to me; I’ll get back to that in a moment. The story finds the Doctor and Ace visiting a decaying shipyard for the purpose of watching a launch. In the course of it, they encounter a man named Salim. Salim is a shadow trader; he removes the shadows from unsuspecting individuals, and sells them to ship construction crews to be attached to the ship, thus giving it a “soul” of its own. It’s an ancient profession, going back to buildings on Earth, but it isn’t a very honest one. Salim gets more than he bargains for when he targets Ace’s shadow. The presentation is decent, as usual; Sophie Aldred had been voicing Ace for Big Finish for a very long time by the time this story was released, and audiobooks seem to have been an easy transition for her. Her presentation of the Seventh Doctor is a little rough, but that’s only because her voice is (obviously) quite different from his; she captures his tone and mannerisms fairly well. There are no continuity references to speak of; the Doctor does mention having encountered shadow traders in nineteenth century London, and possibly at the construction of the Sphinx as well, but those references don’t seem to be attached to any stories. Overall: Not the greatest of the Seventh Doctor’s anthology stories. It could have been better, but just didn’t hit the mark. We’ll see if things improve when we reach the individual Short Trips. Next time: We’ll finally reach the last installment in the Short Trips anthologies! We’ll join the Eighth Doctor, sans companions, in Quantum Heresy. See you there! All audio dramas featured in this series may be purchased from Big Finish Productions; this story’s purchase page is linked below. We’re back, with another Big Finish Doctor Who audio drama review! Today we’re listening to To Cut a Blade of Grass from the Short Trips, Volume IV anthology. Featuring the Sixth Doctor and Peri Brown, this story was written by Cindy Garland, and read by Colin Baker. Let’s get started! A woman named Rosie stands in a parking lot, staring up at the stars and feeling alienated, knowing difficult times are ahead. Then she enters the hospital. Hospitals are strange places, in both time and space. Rosie visits her father, who is both there and not; he stares into space, ignorant of the television. His stroke has taken away his ability to speak, so she speaks to him, in a whisper that she can’t explain even to herself. She babbles about the weather, watching his reactions, knowing he sees through her. Finally he silences her and tries to speak, but she cannot understand him. At length, he sleeps. The nurse reassures Rosie that her father is the same as before; he is simply tired from his other visitor. Other visitor? Rosie didn’t know anyone else was coming. The nurse describes him as eccentric, with a strange dress sense, and an ageless look under curly blonde hair. Rosie visits a nearby café, then returns. She finds a new nurse—short, dark-haired, with an American accent—helping her father into a wheelchair; the nurse says he is to sit up for fifteen minutes each day as part of his therapy. The nurse leaves them alone together; Rosie stays until visiting hours end. She is a mile away from the hospital when she gets a call: her father is missing. Rosie immediately suspects the nurse, and discovers that no nurse of that description is employed at the hospital. She races back to the hospital—and find that her father has reappeared. Everyone is apologetic, but no good explanation is forthcoming—just an alleged error. However, he seems better, somehow. Rosie stands outside a moment, when she is interrupted by a stranger offering her…parsnips? She is stunned for a moment, but the man’s manner is disarming enough—and he is certainly eccentric. She has a hunch… ”Do you know my father?” The man does, and introduces himself as John Smith. He assures her that her father is very proud of her, and talks of her often. She isn’t sure, and feels compelled to explain; she is an aspiring writer, with high marks and considerable skill, but little success; when her father’s convalescence is complete, she intends to go back for a business degree instead. The man questions her decision; in the grand scheme of things, even though business will feed a person, great works of art endure. Rosie’s phone rings, and she turns to answer it; when she turns back, John Smith has vanished. Aboard the TARDIS, the Doctor is in a morose mood. Peri remarks on it, and tells the Doctor that what he did for the old man was quite kind—taking him to the future to see his daughter’s wedding, his grandchildren, his daughter’s eventual death. Isn’t this forbidden, though? Well, perhaps the Doctor bent the rules a bit—after all, he didn’t change anything, or at least, nothing unintentional. The man was Walter Wibberley, a baker, a man of no great repute; the Doctor met him over some excellent Cornish pasties. The Doctor became first his customer, and then his friend. Though he knew the Doctor was a Time Lord, they never traveled together; but the Doctor gave him a telescope, which he treasured. Peri thinks the man must have done something of significance; but the Doctor says no, he simply liked to look at the stars and bake things. Still, Peri has a point; most of the Doctor’s friends are people of great accomplishments. Walter was not so, but what he did, he did very well; and that was often enough to improve the day—and the life—of a man like the Doctor. He is gone now, the Doctor admits. However, the Doctor says that he didn’t come to make Walter happy; he came to keep Rosie from giving up on her writing. Even in this she won’t be successful; but if she chooses business, she won’t work at a bookshop one day, where she won’t meet her husband. You see, if she does meet him, she will form a habit of slipping love poems into his pockets. One day he will read one on the train, and smile at another man, who will in turn make more human decisions at his company. The cleaning lady at that company will therefore keep her job, and will buy her son an electronic kit, which will lead him to become an engineer, who will design a component of a deep-space telescope that will therefore last much longer than expected, allowing humanity to make some great discoveries, which will further humanity’s history. So, Walter does do something great…just, not on his own. After all, all things are connected, and everyone matters, regardless of fame. As the old proverb says, “To cut a blade of grass is to shake the universe”. Now, what could be more appropriate than pasties for dinner…and parsnips, of course? To Cut a Blade of Grass is a sentimental story—let’s say that up front. I find it fascinating that, the more such stories I hear, the more obvious it becomes that Colin Baker’s Doctor—long known for being the most abrasive—is well suited to this type of story. I thought for a long time about why that would be so; all I can conclude is that his strong emotions aren’t limited to anger, but rather, cover the full range. All the various Doctors are passionate, but none more so than Six, and it shows here. In this story, the Doctor visits an old friend who is dying, and in the course of it he makes a casual—but supremely lasting—impact on the old friend’s daughter. The Doctor is not a character given to introspection, or to revisiting his own past—how many companions has he abandoned, never to return (Tenth Doctor farewell tour notwithstanding)?—so when he does it, it has impact. Personally, I think the short trip format—especially the extra-short version found in these early anthologies—is better suited to this sort of thoughtful, non-action, human-interest story; but given that the previous entry was a decent action story, your mileage may vary. Next time: We’re nearly done with the anthologies! We’ll check in with the Seventh Doctor and Ace in The Shadow Trader. See you there! We’re back, with another Big Finish Doctor Who audio drama review! 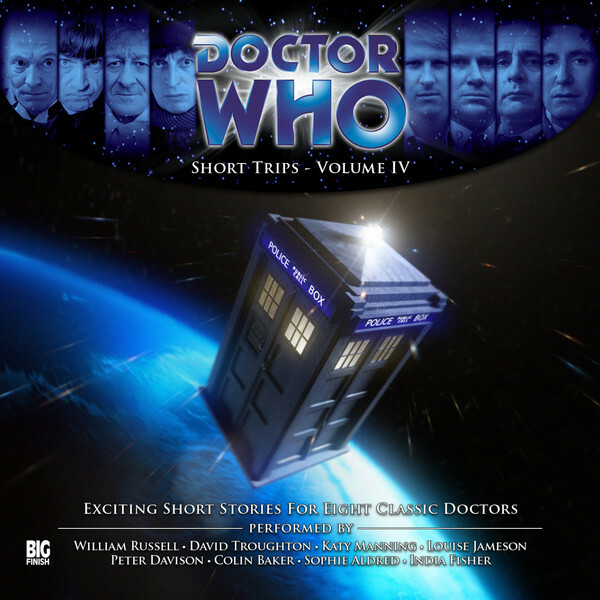 Today we’re listening to The Lions of Trafalgar, the Fifth Doctor’s entry in the Short Trips, Volume IV collection. Written by Jason Arnopp and read by Peter Davison, this story was published in August 2011, and features the Fifth Doctor, Tegan, and Nyssa. Let’s get started! The Doctor, Nyssa, and Tegan arrive in London on 23 October 1843; Tegan is amazed at the primitive state of the city, which is both relaxed and busy at the same time. Visiting Trafalgar Square, they discover a number of stone lions, but quickly discover that the lions are only visible to the three of them. The Doctor concludes there is a perception filter in place, but one that can only affect people of this time. The Doctor climbs the newly-constructed Nelson’s Column to have a look around. At the top, he finds two men, Samuel Morton Peto and Thomas Grissell, who are the contractors responsible for construction of the column. They are famously having tea at the top of the still-statueless column, along with twelve of the stonemasons. The stonemasons are nowhere to be seen, however. The two contractors have been possessed by a predatory race called the Sevakrill, who have used them—to the Doctor’s disgust—to devour the twelve stonemasons. It is a celebratory dinner, to be sure; but it is the Sevakrill who are celebrating their own impending conquest! The column, they reveal, holds a missile that is scheduled to destroy the Earth, but not until 2017, when it will serve to distract their enemies, a force called the Charnal Horde; and it will entertain the Sevakrill as well. The Doctor speaks to the two men instead of the Sevakrill, and tries to get them to build a mental barrier against the Sevakrill, using Nelson’s honorable example for strength. Below, the lions begin chasing Nyssa and Tegan at the command of the Sevakrill, in order to disrupt the Doctor’s efforts. Eight people—seven civilians and a policeman—are killed during the chase. The lions are interrupted as the Sevakrill are forced out of their hosts; and the lions return to their plinth. The hosts are left with their freedom and a stomachache; the Doctor declines to tell them that it comes from their unwitting cannibalism. The Doctor spends the next two weeks working to remove the missile. He is unable to eliminate it completely, but lowers it into a tunnel below, and puts a floor under it (since the missile is aimed down at the Earth instead of up). He also places a signal that will bring him back if it is every activated. As the lions are still in place—but invisible—he sets the perception filters to switch off in a few decades, and arranges to have the lions covered and then unveiled as if they had been newly placed—thus maintaining known history. He also makes a note to skip ahead thirty-five years and see if anyone has tampered with Cleopatra’s Needle. The Fifth Doctor’s entries into these early volumes—of which, as a reminder, this is the last—have consistently been some of the most action-packed, but also some of the most ridiculous. This volume, at least, takes a break from the ridiculousness; this is a believable enough adventure as Doctor Who goes. We visit the 23 October 1843 completion of Nelson’s Column, a few weeks before its famous statue is placed; the Doctor is forced to thwart an alien sleeper plot which will eventually—give or take seventeen decades—destroy the Earth. Nyssa and Tegan aren’t much help here, but they do get chased by the titular stone lions, which is really the only reason for the lions to be in the story at all, as historically it would be a few decades before they were built. That sort of splitting of the plot into two parallel tracks is, of course, common in Doctor Who even today, with the Doctor going one way while his companions go a separate-but-related way. Usually the companion’s track is a little more vital to the story, but unfortunately, sometimes—like here—it’s just extraneous. Continuity References: Nelson’s Column has been visited previously, as early as The Dalek Invasion of Earth. Perception filters, which here conceal the lions, were first mentioned in Torchwood (Everything Changes) before making their way to the main series (Human Nature episode version, et al.). The Doctor claims—typically, if you ask me—to be a friend of Nelson (World Games). Tegan tries to dissuade the Doctor from climbing the column, noting that climbing ended badly for him last time—a reference to his regeneration after falling from the Pharos Project telescope (Logopolis). As well, given that the Doctor is only accompanied by Tegan and Nyssa, this story must occur between Earthshock and Mawdryn Undead. Overall: Pretty quick for an action story, but decent enough. If anything, it was over too quickly, but it was fun while it lasted. I understand that later short trips are perhaps double the length of these anthology stories; I think that’s a more workable length for an action story like this. Still, not bad. Next time: We join the Sixth Doctor and Peri in To Cut a Blade of Grass! See you there.